Last week, all members of the Internet community -- from media to marketing to developers -- came together in New York for Internet Week. The week was jam-packed with fantastic speakers (and I mean packed -- check out the schedule here), and thanks to the power of video and the Web, tons of panels were available online for my viewing pleasure. I especially enjoyed a Tuesday night session on how design is taking over the newsroom. During this panel, five bigwig media executives discussed the importance of design in their newsrooms. The consensus? The design process starts immediately -- as soon as the story idea is born. And not only are reporters working with the art department, but they are also working with on-staff developers and sometimes designing their digital stories themselves. originally written for The Halloween Insider 2012. _ The big standout for Ricky’s NYC this past Halloween started on National Walk of Shame Day. The New York-based hair care and cosmetics retailer, which has expanded to become a costume supercenter, teamed up with vodka manufacturer Svedka for a novelty product, the Walk of Shame After, After Party Pack. The two declared July 27 to be the day to “Forget the blame, and embrace your game.” Inside the pack, owners could find everything needed for that morning after. The pack was a hit, and the duo teamed up for a new product, the Svedka_Grl Halloween costume. Tonight, international children’s charity Kids in Distressed Situation (K.I.D.S.) will host a gala in New York City to celebrate corporate giving and philanthropy. For 26 years, K.I.D.S. has provided more than 65 million children in need with more than one billion dollars of new clothing, toys, juvenile products, books, and basic necessities. The event, which starts tonight at 6 p.m., is expected to attract more than 700 executives from the retail, fashion, and children’s industries. Hosted by actress and comedian Caroline Rhea (Sabrina the Teenage Witch, The Caroline Rhea Show, voice of Linda Flynn on Phineas and Ferb), the 26th Annual Gala will honor JCPenney, Levi’s Brand, and Delta Children’s Products for their philanthropic efforts. BTF Concerts, a concert production company founded earlier this year, has put together an all-star lineup for the “Rock the Schools” concert, which will benefit music programs in New York state public schools. The concert will be held November 18 at 7:30 p.m. at the Gramercy Theatre in New York City. Headlined by Tyler Hilton, a triple threat of singer, songwriter, and actor (One Tree Hill, Single Ladies, Walk the Line), and pop/rock star Ryan Cabrera with singer/songwriter/actor Bryan Greenberg (HBO’s How to Make it in America, One Tree Hill, Friends with Benefits), the benefit concert will be an intimate, acoustic show for an important cause. Many New York school are facing major budget cuts and music departments are often the first to go. With stars in attendance, including reality TV stars La LaVasquez (La La’s Full Court Life) and Alex McCord (The Real Housewives of New York City) as well as actresses Daya Vaidya (Unforgettable) and Kelly Rutherford (Gossip Girl), Disney Store Times Square held an event last week announcing its most sought-after toys for the holiday season. Topping the list was the Animators’ Collection princess toddler dolls, a line of all 10 Disney Princesses re-imagined as toddlers. Each 16-inch doll is outfitted in a unique wardrobe and comes with a plush embroidered friend. Disney animators Mark Henn and Glen Kleane oversaw the creation of the collection. Earlier this week, I attended a press conference by Microsoft, "Kinect for Kids," at which the company announced Kinect Sesame Street TV and Kinect Nat Geo TV. Both platforms, scheduled to launch in the spring, allow kids and other fans to enter the worlds of Sesame Street and National Geographic and interact with the characters as they watch series episodes. Just as Kinect dance games allow players to become the star on the screen, and how Kinect sports games track users' physical motions, both Kinect Sesame Street TV and Kinect Nat Geo TV allow kids to "do more than just watch episodes, but engage, play, and learn." Television no longer becomes passive, but an active experience. For more information, read this blog I wrote on ToyBook.com. And check out these photos I took at the showcase! The following is a Q&A, originally published for ToyBook.com. Walking into the toy section of a store like Target during the holiday season can be overwhelming for shoppers, who are faced with toy aisle upon toy aisle of great products to choose from. Thousands of additional products can be found online. Those that make it onto store shelves during the season are often thought of as the crème de la crème, and being chosen for Target’s shelves can bring tremendous success to a toy manufacturer. Stephanie Lucy, Target’s vice president of merchandising, chats with Elizabeth A. Reid of The Toy Book to talk about holiday merchandising strategies, how it makes its toy selections, and what Target is doing to become a top destination for holiday shopping. The Toy Book: Let’s paint a picture of how great toys get to Target. How far in advance do you plan for each holiday season? Stephanie Lucy: We actually start looking for content for the holiday season in September or October the year before. For example, we are going to market right now to look for products for next holiday season. TB: So, how do you pick the toys? When you are at market, what do you look for? SL: First of all, it starts with us evaluating what is currently working at Target—what’s selling and what’s not—and ensuring that we understand what the guest is interested in. Beyond that, it really is strong partnerships with our vendors. We do business with the largest toy manufacturers around the world. So, it’s sitting down with them and understanding what they believe the hottest toys are going to be, and what they believe content should look like for the year to come. Last Friday, residents of the American Cancer Society's Hope Lodge in New York City enjoyed an afternoon of pampering, including manicures, pedicures, and neck and foot massages, plus treats and drinks from local shops. The event, hosted by footwear company FlipOut Sandals, honored the staff and residents of the organization, in recognition of Breast Cancer Awareness Month. The Hope Lodge is a residential complex that houses cancer patients who travel from out of state to New York City for cancer treatments, free of charge. That evening, residents returning from their morning chemotherapy treatments got the chance to sit down and relax as the common room was transformed into a spa. Residents and staff also received coupons to redeem a free pair of FlipOut Sandals online. 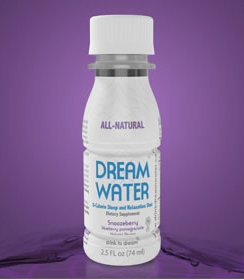 Dream Water: "Like Ambien in a bottle"
I often have a hard time falling asleep with the million things that are running though my mind daily, so when I stumbled across the Dream Water booth at Getting Gorgeous 2011, I was intrigued. The company representative told me it was “like Ambien in a bottle,” but all natural and with zero calories. My skepticism must have been apparent on my face, because the rep promptly handed me a couple of mini 2.5-ounce versions of the drink, called a shot, and simply said: “Try it.” So I did. Snoozeberry was the flavor I was given. Although a little sweeter than I would like, its taste exceeded my expectations. After preparing myself for my best “blech!” face, I was pleasantly surprised as the shot’s berry-flavored undertones. Get the latest news in the parenting realm! Are you subscribed to my Parenting Weekly online paper? Visit paper.li/ElizAlexReid/parenting to read and sign up! Elizabeth A. Reid is a writer and editor interested in media, business, culture, family, relationships, lifestyle and politics.